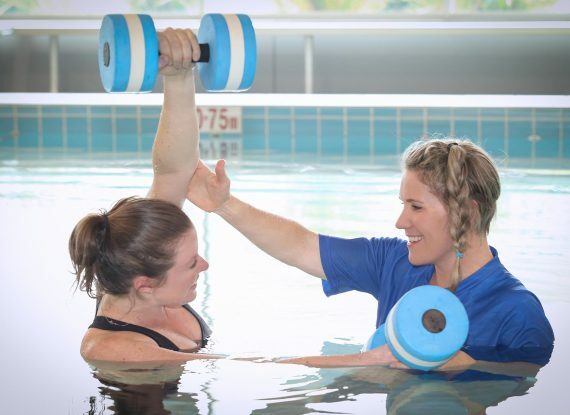 We are proud to be Canberra’s best hydrotherapy treatment provider. Immerse yourself and enjoy the benefits of specialised aquatic healing and rejuvenation. We are conveniently located for hydrotherapy patients in Canberra and surrounding areas. Our team are not just hydrotherapy specialists, they are all Exercise Physiologists and Physiotherapists. We have relationships with orthopaedic surgeons, sports medicine specialists, leading doctors, and pain management professionals, so you have access to the most complete roster of therapies and treatment techniques available. Our advanced therapy facility is equipped with specialist, custom designed pools with superior therapeutic features: variable depth, graduated entries, non-slip tiles, safety ledges and hand rails. Automated water treatment systems ensure sanitary water that exceeds industry safety standards. Hydrotherapy and aquatic physiotherapy can be a primary intervention, or may be deployed to support non-aquatic treatment techniques. Our team will assess your requirements and design a personalised exercise program that fits your needs. Our aquatic physiotherapy services are convenient, effective and affordable. Contact us today to find out how Capital Hydrotherapy can share the healing and rejuvenation benefits of water-based therapy with you. Buoyancy. Natural buoyancy of water comfortably supports patients’ weight and reduces stress on joints. Exercises and treatments are easier, more comfortable and safer performed in water. Viscosity. Hydrotherapy exercise patients benefit from water resistance, which provides more efficient muscle strengthening results compared to using weights. Hydrostatic pressure. Water supports tissues naturally, helping relieve swelling in damaged areas and improve joint position awareness in rehabilitation therapies. Warmth. Warm water is not just comfortable and soothing, it also relaxes muscle tissues and vasodilates blood vessels, which allows for increased blood flow and more efficient healing of injuries.